Fresh from the PyeongChang 2018 home page, Samsung is encouraging free downloads of the Games' new mobile app. Interpreting the Korean/English promotion, I gather this new app -- which took about 10 minutes to upload to my Galaxy 3 purchased after a slick demo during Sochi 2014 -- is free now through January 31. It's unclear whether the app will then be available for a buck, er, won or two during February (make that 1,000 or 2,000 won). Upon launching the app, I found it easy to navigate and fairly basic, likely to become expansive and delightful in ease-of-use during Games time when daily activities, venue updates, results and transportation items are all the buzz of many an Android and iPhone. Very handy: weather updates on the home screen (in Celsius -- it's minus 12 in Korea as I write this post). A finger click on the weather plus sign (+) expands the to a venue-by-venue page and list including temps and icons indicating snow, sun or other current conditions across the Olympic region. The home screen also dons Omega's Olympic Games Countdown clock followed by sections for news and a series of boxes in Korean that I suspect may become the advertising/promotional nod. The list icon at the top left of the home page expands to two core sections for Games and Spectators, with schedules, sports, venues, cheering/fan, official partner/sponsor and links. In these app sections, I simply LOVE the link to the 2018 Olympic Torch Relay in progress (great calendar, maps and photos). Also LOVE the section for the Cultural Progamme. Did you know the Korean National Ballet will perform "Anna Karenina" at the Gangneung Art Center, for instance? And I just bought my ticket for the Jarasum International Jazz Festival on Valentine's Day, also in Gangneung, via the app. Music to my fingers. 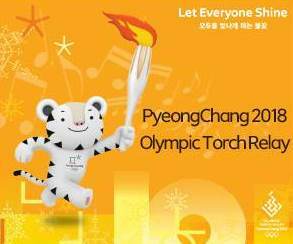 Rounding out the Spectator section: Explore Korea, Tickets, Transportation, Accommodations and Store links to official merchandise. The only thing silly I found about the app is the image created to promote it. Is the guy in the over-sized red sweatshirt supposed to be Korea's answer to illusionist David Seth Kotkin? 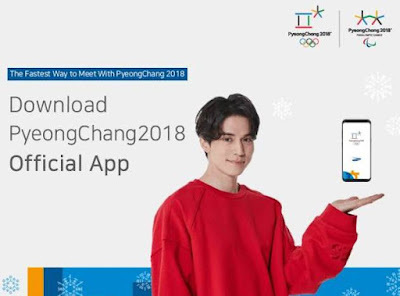 Samsung's 2018 Olympic app -- apropos for any Korea-bound traveler for next month!